This paper introduces a high-gain single-stage boosting inverter (SSBI) for alternative energy generation. As compared to the traditional two-stage approach, the SSBI has a simpler topology and a lower component count. One cycle control was employed to generate ac voltage output. This paper presents theoretical analysis, simulation and experimental results obtained from a 200 W prototype. The experimental results reveal that the proposed SSBI can achieve high dc input voltage boosting, good dc–ac power decoupling, good quality of ac output waveform, and good conversion efficiency. Fig.1. Topology of the proposed SSBI. Fig. 3. Simulated waveforms of the SSBI’s output voltage Vac , dc-link voltage Vdc , and dc input source current Ig with the TI operating at the CCM–DCM boundary (Po = Pob ). Fig. 4. Simulated waveforms of the SSBI’s output voltage Vac , dc-link voltage Vdc , and dc input source current Ig : (a) illustrating the undistorted output voltage Vac , when SSBI is operated in deep DCM just above the minimum power level Po > Pomin and (b) illustrating the peak-shaving distortion of the output voltage Vac for Po < Pomin . A high-gain SSBI for alternative energy generation applications is presented in this paper. The proposed topology employs a TI to attain high-input voltage stepup and, consequently, allows operation from low dc input voltage. 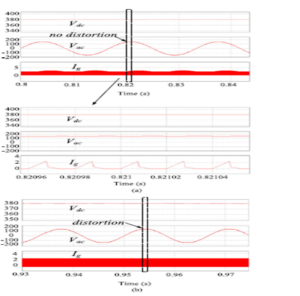 This paper presented principles of operation, theoretical analysis of continuous and discontinuous modes including gain and voltage and current stresses. To facilitate this report, two stand-alone prototypes one for 48 V input and another for 35 V input were built and experimentally tested. Theoretical findings stand in good agreement with simulation and experimental results. Acceptable efficiency was attained with low-voltage input source. The proposed SSBI topology has the advantage of high voltage stepup which can be further increased adjusting the TI turns ratio. The SSBI allows decoupled control functions. By adjusting the boost duty cycle Dbst, the SSBI can control the dc-link voltage, whereas the output waveform can be shaped by varying the buck duty cycleDbk. The ac–dc power decoupling is attained on the high-voltage dc link and therefore requires a relatively low capacitance value. The OCC control method was applied to shape the output voltage. OCC’s fast response and low sensitivity to dc-bus voltage ripple allowed applying yet smaller decoupling capacitor value, and has demonstrated low THD output for different types of highly nonlinear loads. S. B. Kjaer, J. K. Pedersen, and F. Blaabjerg, “A review of singlephase grid-connected inverters for photovoltaic modules,” IEEE Trans. Ind. Appl., vol. 41, no. 5, pp. 1292–1306, Sep. 2005. D. C. Martins and R. Demonti, “Interconnection of a photovoltaic panels array to a single-phase utility line from a static conversion system,” in Proc. IEEE Power Electron. Spec. Conf., 2000, pp. 1207–1211. Q. Li and P.Wolfs, “A current fed two-inductor boost converter with an integrated magnetic structure and passive lossless snubbers for photovoltaic module integrated converter applications,” IEEE Trans. Power Electron., vol. 22, no. 1, pp. 309–321, Jan. 2007. S. B. Kjaer, J. K. Pedersen, and F. Blaabjerg, “Power inverter topologies for photovoltaic modules—A review,” in Proc. Ind. Appl. Conf., 2002, vol. 2, pp. 782–788. C. Vartak, A. Abramovitz, and K. M. Smedley, “Analysis and design of energy regenerative snubber for transformer isolated converters,” IEEE Trans. Power Electron., vol. 29, no. 11, pp. 6030–6040, Nov. 2014. This paper presents a new E-Type module for asymmetrical multilevel inverters with reduced components. Each module produces 13 levels with four unequal DC sources and 10 switches. The design of the proposed module makes some preferable features with a better quality than similar modules such as the low number of semiconductors and DC sources and low switching frequency. Also, this module is able to create a negative level without any additional circuit such as an H-bridge which causes reduction of voltage stress on switches. Cascade connection of the proposed structure leads to a modular topology with more levels and higher voltages. Selective harmonics elimination pulse width modulation (SHE-PWM) scheme is used to achieve high quality output voltage with lower harmonics. MATLAB simulations and practical results are presented to validate the proposed module good performance. Module output voltage satisfies harmonics standard (IEEE519) without any filter in output. This paper presented a new multilevel inverter topology named as Envelope Type (E-Type) module which can generate 13 levels with reduced components. It can be used in high voltage high power applications with unequal DC sources. As E-Type module can be easily modularized, it can be used in cascade arrangements to form high voltage outputs with low stress on semiconductors and lowering the number of devices. Modular connection of these modules leads to achieve more voltage levels with different possible paths. It causes an improvement in the reliability of the modular inverter which enables it to use different paths in case of malfunction for a switch or a driver. The main advantage of proposed module is its ability to generate both positive and negative output voltage without any H-bridge circuit at the output of the inverter. THDv% is obtained 3.46% and 4.54% in simulation and experimental results, respectively that satisfy harmonics standard (IEEE519). Also module is tested in three frequency and under different resistive – inductive loads which results shows good performance. R. Feldman, M. Tomasini, E. Amankwah, J.C. Clare, P.W. Wheeler, D.R. Trainer, R.S. Whitehouse, “A Hybrid Modular Multilevel Voltage Source Converter for HVDC Power Transmission,” IEEE Trans. Ind. Appl., vol.49, no.4, pp.1577–1588, July-Aug. 2013. 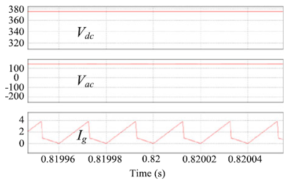 M. Odavic, V. Biagini, M. Sumner, P. Zanchetta, M. Degano, “Low Carrier–Fundamental Frequency Ratio PWM for Multilevel Active Shunt Power Filters for Aerospace Applications,” IEEE Trans. Ind. Appl., vol.49, no.1, pp.159–167, Jan.-Feb. 2013. Liming Liu, Hui Li, Seon-Hwan Hwang, Jang-Mok Kim, “An Energy-Efficient Motor Drive With Autonomous Power Regenerative Control System Based on Cascaded Multilevel Inverters and Segmented Energy Storage,” IEEE Trans. Ind. Appl., vol.49, no.1, pp.178–188, Jan.-Feb. 2013. Yushan Liu, Baoming Ge, H. Abu-Rub, F.Z. Peng, “An Effective Control Method for Quasi-Z-Source Cascade Multilevel Inverter-Based Grid-Tie Single-Phase Photovoltaic Power System,” IEEE Trans. Ind. Inform., vol.10, no.1, pp.399–407, Feb. 2014. Jun Mei, Bailu Xiao, Ke Shen, L.M. Tolbert, Jian Yong Zheng, “Modular Multilevel Inverter with New Modulation Method and Its Application to Photovoltaic Grid-Connected Generator,” IEEE Trans. on Power Electron., vol.28, no.11, pp.5063–5073, Nov. 2013.